Six time Miami Open champion Novak Djokovic is back on court Sunday afternoon. The multiple major winner will face Argentine Frederico Delbonis as he attempts to qualify for the fourth round. This will be the first ATP encounter for these two. 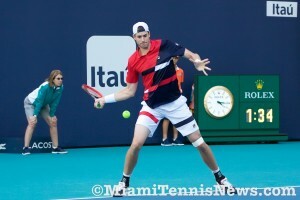 John Isner continues his title defense. In the day’s initial match on stadium court, the American will be challenged by Spaniard Albert Ramos Vinolas. This will be their maiden meeting on hardcourt. They’ve split their prior two on clay. The night session will conclude with Australian Nick Kyrgios battling Serbian Dusan Lajovic. Kyrgios walked away with the victory in their one previous showdown last year. Wimbledon finalist Milos Raonic will finally be on court for the first time after getting a walkover into the third round. He will collide with Brit Kyle Edmund. Novak Djokovic booked a spot in his 13th consecutive final at the Masters 1000 and World Tour Finals levels by defeating David Goffin 7-6(5), 6-4 in the Miami Open semis on Friday afternoon. Djokovic improved to 27-1 on the season (his only loss has come via retirement) after two hours and five minutes. 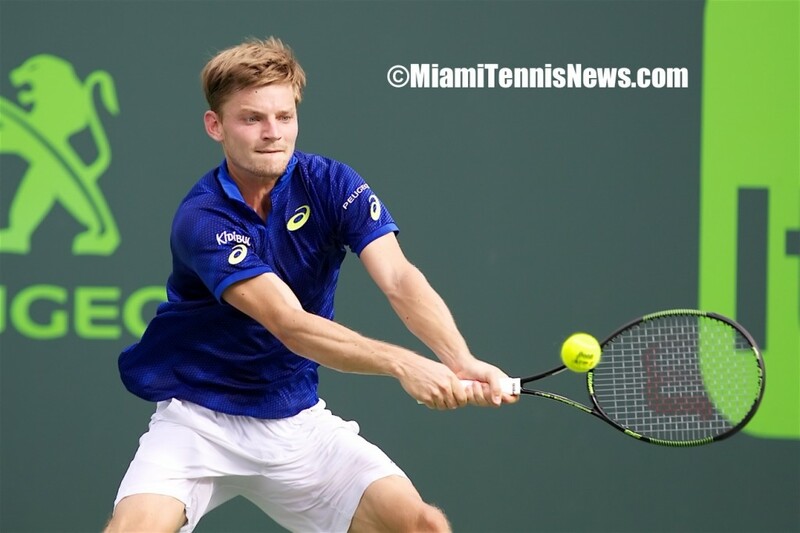 Playing in his second straight Masters 1000 semifinal, having reached the same stage in Indian Wells, Goffin got off to a blistering start. The 15th-ranked Belgian survived a marathon service game at 2-3, after which he promptly broke Djokovic for a surprising 4-3 advantage. But the top-seeded Serb broke right back for 4-4 and never relinquished the momentum. Djokovic gave back a mini-break at 4-3 in the tiebreaker, but he regained the upper hand with a return point at 5-4 before closing out the ‘breaker at 6-5. A more straightforward second set saw the world No. 1 use a single break at 3-3 to get the job done. “I was aware of the level that he raised his game in last couple of months,” Djokovic said of his opponent. “And the fact that he played the first semifinals of a Masters 1000 event in his career in Indian Wells gave him–obviously–confidence coming into today’s match. I knew he [was] going to try to take his chances; going to try to be aggressive. In the nightcap, Kei Nishikori had no fear against a confident Nick Kyrgios. With a remarkably clean performance, the Japanese star quieted the 20-year-old Australian 6-3, 7-5 in one hour and 24 minutes. Nishikori gave back a break midway through the second set with a double-fault, but that was the only occasion on which he dropped serve. The world No. 6 made up for it by breaking Kyrgios at 6-5. He capitalized on his second match point with a lunging forehand volley at the end of an entertaining rally. 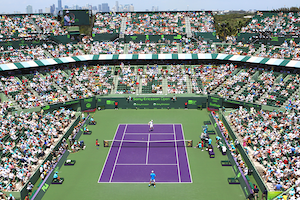 Kei Nishikori saved five match points before outlasting Gael Monfils 4-6, 6-3, 7-6(3) in a semifinal thriller at the Miami Open on Thursday afternoon. Nishikori withstood 14 aces by his opponent and overcame six double-faults off his own racket to prevail after two hours and 29 minutes. The high-quality roller-coaster ride saw Monfils recover from a break deficit in the deciding set. With momentum in hand, the world No. 16 put himself within one point of victory on five different occasions. He came close to converting his fourth chance when he tracked down a drop-shot and flicked it cross-court, but Nishikori answered with a winning volley. It almost, of course, never got to a tiebreaker. Of Monfils’ five match points, four came with Nishikori serving at 4-5 and the last one at 5-6. Next up for the world No. 6 is a second career meeting with Kyrgios, whom Nishikori defeated 1-6, 6-4, 6-4 last fall in Shanghai. It will be another contrast in temperaments for Kyrgios after he faced the mentally solid Milos Raonic on Thursday night. 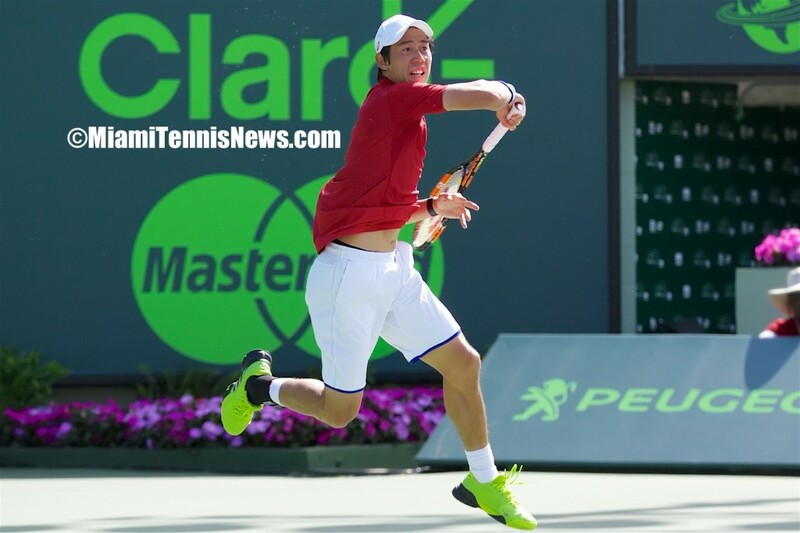 Although the 20-year-old Australian is nothing short of combustible, himself, his trek through the Miami draw has mostly no-nonsense aside from a brief spat with the chair umpire during a fourth-round win over Andrey Kuznetsov. He has also refused to surrender a single set in four victories. Kyrgios booked a spot in his first-ever Masters 1000 semifinal by upsetting Raonic 6-4, 7-6(4) in one hour and 44 minutes. 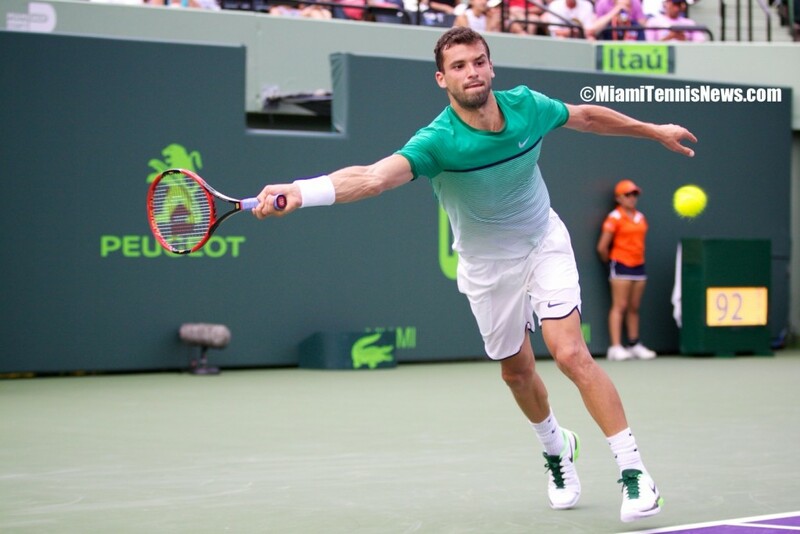 The 24th seed fired eight aces and saved all five of the break points he faced.